I regularly travel to Osaka to practice Daito-ryu with my sensei in Takumakai. This trip (May 2013), I thought I would follow up on a recommendation to meet Yushinkai’s Okajima sensei as well. Thanks to Dan James who arranged for my introduction. Arriving at Okajima sensei’s dojo was easy as it turned out to be around the corner from my hotel. I don’t speak fluent Japanese so I was very fortunate when I arrived that there was a Japanses Aikidoka who was a fluent English speaker. Explaining that I was a student of Daito ryu Takumakai was interesting, Okajima sensei made some phone calls to verify my identity before letting me into the dojo. Once he was satisfied I was not some blow-in he seemed very interested in me and ran the class towards catering to my interests for which I am very grateful. The first class I attended with sensei was of a martial art called Goshindo. I have a brochure that he gave me in English which helped me to understand it a bit better. 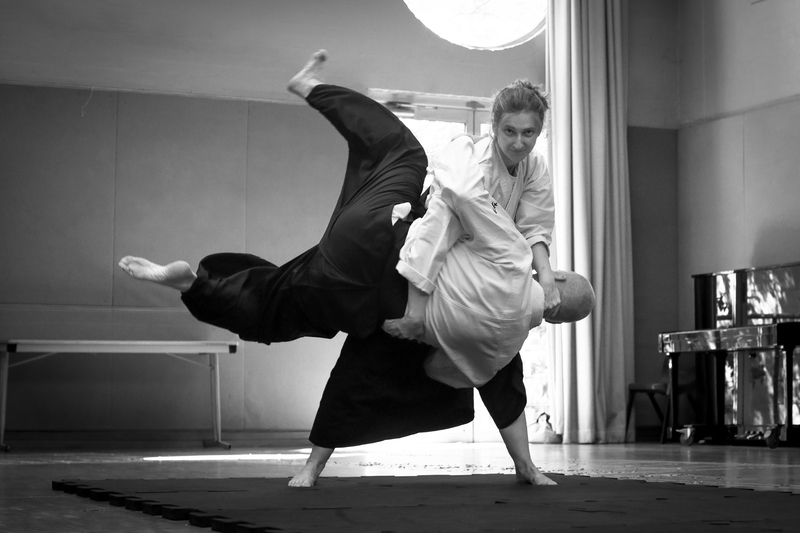 In Goshindo there is a strong emphasis on the understanding of centre and balance and health of mind and body were also key themes all of which make for a complete martial art. Class starts with a meditative massage that is intended to help the body’s internal connections. During class, there was much discussion of dantien / tanden as it related to performing techniques efficiently. An interesting tool used was a short stick which is held between the hands in front of the body to promote an understanding of the movement of centre through movement of technique. Taking of written notes was also encouraged during class. One exercise that stood out for me was using a centre turn to draw uke off balance after uke grabs nage’s lapel. Okajima sensei also held a second class in Roppokai Daito ryu for my benefit on the night of my first visit. I was very grateful for his focus on an area of my interest. Sensei demonstrated a number of Roppokai techniques. Idori Aiki nage consisted of raising the wrists up on fingers positioned on the knees and feeding into uke’s shoulder to scribe a circle rolling off to the side to effect a throw. Standing Aiki age consisted of extending the fingers as if holding a ball in the palm, pointing the fingers down and extending down from the shoulder before pointing the fingers up at ukes shoulders and moving from the elbow. I particularly liked a cross handed grab defence based on kotegaeshi, which requires a soft walk in and a rolling of the palm over ukes wrist causing uke to drop. This could be done with two opponents. Another of Okajima sensei’s moves that I really liked included a kind of uraotoshi (maybe known as aiki otoshi in Aikido). Uke grabs Tori’s sleeve at the elbow tori in turn grabs ukes sleeve and feeds up through the arm and into the neck before circling around out and down which drops uke at Tori’s feet. Another technique involved the two handed grab of one arm, tori moves his elbow in to press through ukes elbow before turning centre slightly to drop uke. Okajima sensei was a wonderful warm and friendly teacher who has innovative ways of getting students to learn the principles of movement. His skills are very deep across a number of martial arts, he seems to be something of a polymath when it comes to martial arts training. I mentioned that my father teaches Tai Chi and Bagua and so he asked me to walk the circle, which I did the best I could. Then he got up and did it beautifully demonstrating the knee connection that I was missing in my walk. If you travel to Japan I strongly recommend you make a stop in Osaka and spend some time with Okajima sensei. With Jetstar it is not difficult or too expensive. I think that any serious student of Aikido would greatly benefit from practice with Okajima sensei. I hope to come and visit the Aikido Republic Dojo for a Sunday session so I can exchange a bit of what I experienced with Okajima sensei. Dan James sensei will keep you posted. We have had nice interaction with Periott Sensei over the years http://www.aikidorepublic.com/trip-and-seminar-reports/2012-annoiki-sensei-kyoju-dairi-takumakai so nice to be able to extend the relationship a little bit to Japan and continue to explore common ground. Working on a few dates with sensei now.